Political parties, movements and organizations around the world are joining in the campaign to free Khalida Jarrar and Khitam Saafin, issuing statements and demanding the immediate release of these Palestinian women leaders. Below, we reproduce some of the major statements released in support of Khalida Jarrar and Khitam Saafin. Please send your own statements to samidoun@samidoun.net and publicize them widely to expose Israeli violations of Palestinian rights. The Communist Party of Spain (PCE) strongly condemns the attack by Israeli occupation forces on Sunday, July 2, in Ramallah, West Bank, to arrest Khalida Jarrar, a member of the Palestinian Legislative Council, and Khitam Saafin, a feminist activist and President of the Union of Palestinian Women’s Committees, after assaulting and ransacking their homes. The PCE considers that these detentions are part of the permanent policy of apartheid and ethnic cleansing put into practice by the Israeli regime against the Palestinian people and aim to topple the organizations of the struggling, popular, democratic and feminist left. From the PCE we send all our support and solidarity to our sister party, the Popular Front for the Liberation of Palestine, where Khalida and Khitam struggle, and to all the political and social organizations that are fighting legally and justly against an occupying regime that constantly violates the Human Rights of a people that only aspires to live in peace and with dignity on their land. The PCE reiterates its commitment to the end of the occupation and colonization of the occupied Palestinian territories by the Zionist entity; for the dismantling of the apartheid wall and all illegal settlements; for the release of the nearly 7,000 Palestinian prisoners in Israeli prisons for political reasons; for the respect, protection and promotion of the right to return to their homes and property of more than 5.4 million Palestinian refugees, as stipulated by UN Resolution 194; and with the non-violent international campaign of Boycott, Divestment and Sanctions against Israel (BDS). The international community cannot remain silent before the Zionist regime, which systematically violates all United Nations resolutions on the occupation of Palestine. On Sunday, 2 July, Israeli occupation forces conducted an operation, seizing Khalida Jarrar, a legislator of the Palestinian left and advocate for Palestinian prisoners, and Khitam Saafin, President of the Union of Palestinian Women’s Committees, with at least nine others, including Ihab Massoud, released less than six months from Israeli prisons and four community leaders from the al-Aroub refugee camp. The arrest of Khalida Jarrar and Khitam Saafin, feminist leaders and Palestinian progressive strugglers committed to the freedom and liberation of their people, is a clear attack against popular Palestinian movements in an attempt to eliminate them through fear, imprisonment and intimidation carried out by a massive Israeli occupation force. The Israeli army claimed that the arrest of Khalida Jarrar is due to her activities as a member of the Popular Front for the Liberation of Palestine (PFLP), a Marxist organization labeled terrorists by Israel, and not her position as a parliamentarian. However, Jarrar had previously been arrested on 2 April 2015 before being released in June 2016. She was originally ordered to administrative detention without charge or trial, a recurring practice when there are no grounds to detain or imprison Palestinians. Her administrative detention was cancelled only under an international outcry. The MST defends the struggle of the Palestinian people, their liberation and their land. They have the right to enjoy true sovereignty, independence and self-determination, as in the Charter of the United Nations. Israel is accused internationally with a process of dehumanization of the Palestinian people and systematic attack on their basic rights and lives, and it refuses to comply with UN Resolution 194, which guarantees the right of all Palestinian refugees to return to their lands. These arrests represent an attack on the political activity and popular organization of the Palestinian people. Therefore, it is necessary that the people of the world support and demand the release of Khalida Jarrar and Khitam Saafin, and all the thousands of Palestinian prisoners behind Israeli jails. The Palestinian people have the right to struggle against the occupation of their land and to use all means available under international law for their lives and their country. Solidarity with Palestinian women and the Palestinian people! The PCP vehemently condemns the detention by the Israeli Army of Khaleda Jarrar, an MP of the Palestinian Legislative Council, of Khitem Saafin, Ihab Massoud and other activists of the Popular Front for the Liberation of Palestine , on July 2, in the occupied Palestinain territory of the West Bank. It should be recalled that Khaleda Jarrar had been previously detained by the Israeli Army in April 2015, having left prison in June 2016, following a broad campaign of international solidarity for her liberation. The systematic arrests of Palestinian patriots is an integral part of the Zionist policy of occupation and repression, by Israel, against the Palestinian people and those forces, such as the PFLP, which courageously fight for the respect of, and to secure, their legitimate national rights. Israel unacceptably holds in its jails over six thousand Palestinian political prisoners, among which several hundred in administrative detention, without any trial or formal charges, including underage youth. These prisoners have recently carried out a hunger strike for the respect of their rights and dignity. The PCP considers that the Portuguese Government must strive and act, as required by the Constitution of the [Portuguese] Republic and within the framework of International Law, for the rights of the Palestinian people, namely for the respect of the rights of Palestinian political prisoners held in Israeli jails, seeking their liberation. The PCP demands the immediate release of Khaleda Jarrar and of all Palestinian political prisoners, and reaffirms its solidarity with the Palestinian people and their struggle for the creation of a sovereign and viable State, with the pre-1967 borders and capital in East Jerusalem, ensuring the right of return of refugees, as stated in numerous United Nations resolutions. The Party for Socialism and Liberation condemns the Israeli apartheid regime for its arrest and detention of two women leaders of the Palestinian liberation struggle, Khalida Jarrar, an elected member of the Palestinian Legislative Council, and Khitam Saafin, General Coordinator of the Union of Palestinian Women’s Committees, and joins in the worldwide demand for their immediate release. Khalida Jarrar and Khitam Saafin, arrested along with nine others in pre-dawn raids on July 2, have been sentenced to six and three months respectively of administrative detention, without charge or trial. Israel continues its dictatorial and racist rule over the Palestinian people in the West Bank using the emergency military regulations, including administrative detention, employed by the British when they were the colonizing power in Palestine. Khalida Jarrar, elected as a representative of the Popular Front for the Liberation of Palestine, a Marxist party, is now the thirteenth member of the Palestinian Legislative Council imprisoned by the Israeli occupation. Today she and Khitam Saafin are among more than 6,200 Palestinian prisoners held illegally in Israeli jails, nearly all for the “crime” of resisting the Israeli brutal occupation regime. At the same time, there are zero Israelis held in Palestinian prisons. Day after day, the killings, torture, checkpoints, settlements, house demolitions, destruction of olive and fruit groves, the theft of water, the lethal blockade and isolation of Gaza, the apartheid roads, the apartheid everything, continue. None of this could continue without the massive military, economic and political support extended to the Israeli state by Washington. But in the face of vicious repression, the heroic resistance of the Palestinian people continues. Free Khalida Jarrar, Khitam Saafin and all Palestinian political prisoners! On Sunday, July the 2nd, Israeli occupation forces seized Palestinian parliamentarian and prisoners’ advocate Khalida Jarrar along with Khitam Saafin, president of the Union of Palestinian Women’s Committees and at least nine other people, including Ihab Massoud, who was just released less than six months ago from Israeli prisons, and four community leaders in al-Aroub refugee camp. The seizure of Khalida Jarrar – now the 13th member of the Palestinian Legislative Council held by the Israeli occupation – comes almost one year after she was released from Israeli occupation prison following 14 months of imprisonment. Originally administrative detention ws imposed on her, which is in fact a type of imprisonment without charge or trial. Her case was then transferred to the Israeli occupation military courts. The acts of the Israeli occupation forces are illegal, inhumane, contrary to international law and constitute parts of a violent policy attempting to impose the occupation indefinitely and diminish the lawful and legitimate Palestinian resistance. They are parts of a mechanism, the scope of which is to deprive the Palestinian people of their most basic human and political rights, as well as of their right to self- determination. Such a mechanism must be confronted by the whole of the international community. As Hellenic Union of Progressive Lawyers we condemn these latest arrests, demand the immediate release of those arrested and call upon the international legal community to defend the inalienable rights of the Palestinian people and oppose the Israeli state policy. From the Alkarama Palestinian Women’s Movement, a Palestinian, feminist, secular and anticolonialist organization whose main objective is to generate a new space for raising the voice of Palestinian women in the diaspora, we call upon all people and groups in solidarity with the Palestinian cause to act on the 2 July abduction by the Israeli occupation forces of our comrades Khalida Jarrar and Khitam Saafin as well as nine other people seized that same night. Israeli occupation forces arrested the prominent Palestinian left-wing parliamentarian and advocate for Palestinian prisoners, Khalida Jarrar, along with Khitam Saafin, president of the Union of Palestinian Women’s Committees and at least nine other people, including Ihab Massoud, released for less than six months from Israeli prisons, and four other community leaders in a raid on al-Aroub refugee camp on Sunday, 2 July. We join the appeal of Samidoun Palestinian Prisoner Solidarity Network calling for urgent international action to demand their immediate release. Jarrar was last arrested on 2 April 2015; she was ordered to administrative detention, imprisoned without charge or trial. International protest over her case led to the cancellation of her administrative detention. However, her case was transferred to the equally illegitimate military tribunals of the Israeli occupation. Khitam Saafin, General Coordinator of the Union of Palestinian Women’s Committees, has participated in various global events, including the World Social Forum, linking women’s struggles at the international level with the struggle of Palestinian women for national and social liberation . The UCMP has organized and hosted numerous international delegations that have created solidarity with Palestinian women and the Palestinian people. At least seven other Palestinians were seized by Israeli occupation forces in pre-dawn raids on 2 July. Among them was Ihab Massoud, who was released on 12 February after 16 years in Israeli prisons. A leader in the Popular Front for the Liberation of Palestine, he participated in multiple hunger strikes inside Israeli prisons. Alkarama Palestinian Women’s Movement in Diaspora joins with Samidoun Palestinian Prisoner Solidarity Network to urge international mobilization and action to demand the immediate release of Khalida Jarrar and Khitam Saafin, prominent progressive and feminist Palestinian leaders and committed fighters for the freedom and liberation of their people. The detentions of Jarrar and Saafin clearly come as an attempt by the Israeli occupation to attack Palestinian popular movements and suppress them through fear, intimidation, and arrests carried out by a massive armed occupation force. We call on all friends of Palestine and the Palestinian people to join us in reactivating the Solidarity Campaign with Khalida Jarrar as well as the campaign in solidarity with Khitam Saafin. These detentions represent an attack on the political activity and popular organization of the Palestinian people. We must combat this attack with intensified solidarity to demand the freedom of Khalida Jarrar, Khitam Saafin and the thousands of Palestinian prisoners in prisons of the Israeli occupation. FREE PALESTINIAN PRISONERS KHALIDA JARRAR AND KHITAM SAAFIN! NO TO THE OCCUPATION OF PALESTINE! BOYCOTT, DIVESTMENT AND SANCTIONS ON ISRAEL! On this past 2 July, the Palestinian leaders Khalida Jarrar and Khitam Saafin were unjustly detained among 11 Palestinian activists and taken to an unknown location in an operation carried out by the Zionist occupation forces in the West Bank. Khalida Jarrar is a leftist and feminist leader. She represents the PFLP in the Palestinian Legislative Council and is the leader of the Prisoners’ Commission of the PLC. Jarrar has been detained on several occasions by Israeli occupation forces in recent years. In April 2015, she was arrested and after eight months of detention, she was sentenced to 15 months in prison by an Israeli military court. Khitam Saafin is a renowned feminist activist, representative of the Global March of Women and president of the Union of Palestinian Women’s Committees (UPWC). Khitam has been in Euskal Herria several times, most recently in Bilbao in 2014. In addition, we from Komite Internazionalistak have had the opportunity to meet with her to learn about the struggle of Palestinian women when we have traveled to Palestine. These arrests are part of the systematic persecution and arbitrary arrests used by the Israeli occupation army with impunity against Palestinian political leaders and activists as part of Israeli strategies of repression and terror that seek to prevent the organization of popular resistance to confront the occupation and develop the just struggle for the liberation of the Palestinian people. As Komite Internazionalistak, we consider the detention of these two comrades who struggle for the liberation of their people and the emancipation of women to be an attack on democracy, women, and human rights. Therefore, we denounce the illegal detention of the comrades and demand the immediate release of Khalida Jarrar and Khitam Saafin and the other nine detainees. Following the arrest on 2 July 2017 of the member of the Palestinian Legislative Council and leader of the Popular Front for the Liberation of Palestine (PFLP), Khalida Jarrar, together with other Palestinian activists, the Galizan People’s Union (UPG) once again denounces the policy of genocide carried out by the Israeli State against the Palestinian people with the full support of Western governments who turn a blind eye. We demand the immediate release of Khalida Jarrar and all of the other people arrested with her yesterday, as well as the thousands of Palestinian political prisoners currently held in Israeli gaols accused of the ‘crime’ of defending the right of the Palestinian people to build an independent State and to live freely in their own land. We also wish to highlight the fact that Khalida Jarrar’s detention is far from an isolated event, and is part of an orchestrated operation on the part of the State of Israel intended to break the Palestinian resistance movement by imprisoning and assassinating its leaders, whilst at the same time conducting terror and genocide operations on a par with those carried out by Nazi Germany. In fact, it should be borne in mind that the General Secretary of the PFLP, Comrade Ahmad Sa’adat, has been held in Israeli gaols since 2006. From Galiza we denounce this renewed assault on Khalida Jarrar and all of the people detained yesterday and express once more our solidarity with the Palestinian people and our admiration for their exemplary resistance struggle against the occupying forces. Israeli occupation forces have arrested Khalida Jarrar, member of the Palestinian Legislative Council, and Khitam Saafin, president of the Union of Palestinian Women’s Committees. They were taken to an undisclosed location with 9 other people in pre-dawn raids on Sunday, 2 July 2017. Khalida Jarrar, a civil society leader, has been a member of the Palestinian Legislative Council since 2006. She is the chair of the Prisoners’ Commission of the Palestinian Legislative Council and vice-chair of the Board of Trustees of Addameer Prisoner Support and Human Rights Association. Khalida Jarrar has been targeted by Israeli forces. She was released in June 2016 after serving more than a year in prison, including one month in administrative detention. The arrest of Khalida Jarrar is an attack on Palestinian political leaders and Palestinian civil society as a whole. It also comes in the context of ongoing arrest campaigns against Palestinians. The anti-imperialist collective Coup Pour Coup 31 denounces the arrest of Comrade Khalida Jarrar and Khitam Saafin! We call for their immediate release! Palestinian activists arrested: Call for solidarity! Original Post. Also at the website of the Brazilian Communist Party. About 11 Palestinian activists were arrested by the Israeli occupation forces on Sunday, 2 July, including Khitam Saafin, president of the Union of Palestinian Women’s Committees and coordinator of MMF Palestine, and Khalida Jarrar, a prominent left-wing parliamentarian and defender of Palestinian prisoners. The Zionist occupation forces forcibly stormed their homes and took the two women to an unknown destination. Arbitrary arrests are a flagrant violation of human rights which feeds the historical impunity of the occupying forces for acts committed against Palestinians and Palestinian activists. The arrest of eminent Palestinian leaders who dedicate their lives to the freedom and liberation of their people and to the emancipation of women is an attack on democracy, women and the human rights of the Palestinian people. We, the women marchers and friends of the Global March of Women, unite in solidarity and join the call of the Union of Palestinian Women’s Committees (UPWC) and the Samidoun Palestinian Prisoner Solidarity Network to call for an international mobilization to demand their immediate release. 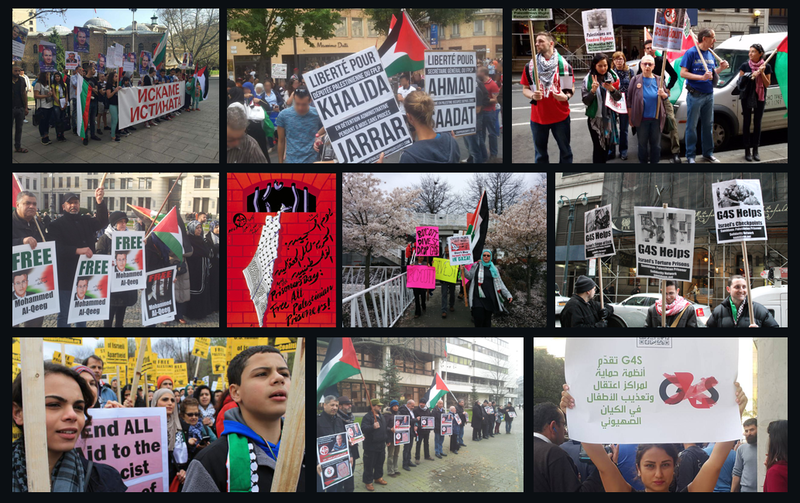 Take action to support Khalida Jarrar, Khitam Saafin and the others! Two prominent Palestinian leaders were seized by Israeli occupation forces from their beds last week and taken to an unknown destination. This petition demands their immediate release. Last weekend, two prominent Palestinian women leaders were seized from their beds during nighttime raids and taken away by Israeli occupation forces. Khalida Jarrar is a member of the Palestinian parliament, prominent feminist and champion of human rights. Khitam Saafin is president of the Union of Palestinian Women’s Committees and is committed to the rights of Palestinian women in a sovereign Palestine, free of Israeli occupation. The ‘arrest’ of the two women should be seen in light of the Israeli policy to deprive the Palestinian people of its leadership. In Palestine and internationally, there has been a furious response. Samidoun, an organization working for Palestinian prisoners, has begun a petition demanding their immediate release. The Rights Forum stands in solidarity with that demand and calls to support the petition and other activities that can contribute to the release of Jarrar and Saafin. In particular, the Rights Forum calls on Dutch political parties, trade unions and civil society organizations to urge Israel to immediately end the witch hunt targeting Palestinian leaders. Internationalt Forum, the Middle East Group, strongly condemns the arrest on Sunday July 2 of Khalida Jarrar, Khitam Saafin and nine other Palestinians by the Zionist occupation forces. Khalida Jarrar is a leader of PFLP, member of the Palestinian Legislative Council and a highly respected feminist and political activist. Israel has continuously tried to silence Khalida by a number of arrests these last years. Khitam Saafin is a feminist activist and leader of the Union of Palestinian Women’s Commitees. This arrest is an act of terrorism and part of the ongoing Israeli attempt to liquidate the Palestinian resistance movement. The Israeli state especially fears strong freedom fighters, antiimperialists and feminists such as Khalida Jarrar and Khitam Saafin. Such acts reveal the true face of the Zionist state of Israel. Not as “the only democracy in the Middle East”, but as a racist settler-colonial state which does not respect the human rights of the Palestinian people, but violates their freedom of speech and organization. We – Internationalt Forum/the Middle East Group – demand the immediate release of the imprisoned two women liberation fighters and of all the other imprisoned Palestinian prisoners in Israeli jails. The Workers’ Party of Belgium (PTB-PVDA) strongly condemns the illegal detention of the Palestinian lawmaker, Khalida Jarrar, along with social activist Khitam Saafin and nine others by Israeli security forces in the occupied West Bank on July 2, and their continued administrative detention. Khalida Jarrar is one of 13 Palestinian parliamentarians currently incarcerated by Israel. She had been released from Israeli prison just over a year ago, and heads the PLC’s Prisoners’ Commission. Khitam Saafin is the General Coordinator of the Union of Palestinian Women’s Committees, an internationally well-respected women’s organization and an active participant to the World Social Forum. Their unlawful arrest and detention constitute an attack against the Palestinian Legislative Council (PLC), against Palestinian political leaders and against Palestinian civil society. The practice of arbitrary detention is a grave violation of international laws and human rights standards. Together with the European Parliamentary Group of the European United Left/Nordic Green Left(GUE/NGL), of which the PTB-PVDA is an associate member, and with human rights organizations, we raise our voice to condemn these illegal arrests and demand the immediate release of Palestinian civil society leaders Khalida Jarrar and Khitam Saafin. On Sunday, 2nd July 2017, the Zionist occupation forces arrested a number of Palestinian national leaders and activists in pre-dawn raids, including four leaders from al-Aroub Refugee Camp, and leaders of the Popular Front for the Liberation of Palestine, former prisoner Ihab Massoud, the Palestinian Legislative Council member Khalida Jarrar, President of Union of Palestinian Women’s Committees Khitam al-Saafin. The court extended both al-Saafin and Jarrar’s detentions on Wednesday, 5thof July. Then, Khitam al-Saafin received three months administrative detention order and shortly after Khalida Jarrar received sixth months. The attacks against the Palestinian leaders cannot suppress the resistance. This is not the first attempt of the Zionist entity to intimidate the Palestinian popular movement. Zionists could not succeed, we are sure they won’t! Khalida Jarrar herself was arrested before in April 2015 and after eight months of administrative detention, she was sentenced to 15 months in prison by an Israeli military court. On the contrary, these vile attacks urge us more to take action against the illegitimate Zionist entity, to do our best to support the Palestinian cause by any means necessary. As DIP (Revolutionary Worker’s Party) of Turkey, we declare our support to the people of Palestine fighting for the freedom of their land and, in particular, to the Popular Front for the Liberation of Palestine. We strongly condemn these attacks against the Palestinian leaders and demand their immediate release! There are currently approximately 500 Palestinians held under administrative detention orders, one of the most hideous legal institutions of the supposedly democratic Israeli state, and 6.200 Palestinian prisoners in total. We express our solidarity with the heroic Palestinian prisoners. Freedom for all Palestinian prisoners! While Saudi Arabia and its Arab allies are busying themselves with pressuring their earlier ally Qatar and while Turkey is supporting the latter in this showdown, both sides leave the hands of Israel free to attack the rightful fight of the Palestinian people. It is up to the proletarian and popular organizations of the Middle East and the wider region to take up the struggle against Zionism. The people of Palestine are not, and never will be alone in their struggle against the illegitimate invader of their land, which is a common threat for all the peoples of the Middle East. Down with Zionism! Down with imperialism! From the river to the sea Palestine shall be free! The Israeli army has ordered six months of administrative detention, indefinitely renewable, against Palestinian parliamentarian Khalida Jarrar. Khalida Jarrar, a Palestinian national leader, left-wing parliamentarian, feminist and defender of Palestinian political prisoners, received a six-month administrative detention order, which can be extended indefinitely. The order was signed by the Israeli occupation military commander of the West Bank and is expected to be confirmed at a hearing at Ofer military court on July 17, according to Addameer Prisoner Support and Human Rights Association. Khalida was seized by Israeli occupation forces who invaded her home in a pre-dawn raid on Sunday, 2 July along with ten other Palestinians including Khitam Saafin, president of the Union of Palestinian Women’s Committees. Khalida is a member of the Palestinian Legislative Council (Palestinian parliament), Chair of its Prisoners’ Commission and Vice President of the Addameer Board. The charge against Khalida comes only three days after Saafin was also sentenced to three months in administrative detention without charge or trial. Administrative detention orders are issued for periods of one to six months, but are indefinitely renewable; Some Palestinians have been imprisoned for years under administrative detention. Khalida is one of 11 Palestinian parliamentarians jailed by the Israeli occupation. Nine of them, including Khalida, are under orders of administrative detention. There are about 500 Palestinians imprisoned under this framework, without charge, trial or right to meaningful legal assistance, among some 6,200 Palestinian political prisoners in Israeli prisons. The widespread and systematic use of Israeli administrative detention violates the Geneva Conventions and the International Covenant on Civil and Political Rights. Including the attempt to forcefully displace her to Jericho from her home in Ramallah in 2014, followed by her arrest and detention in 2015. She was also sentenced to six months administrative detention, however, following an international protest, the administrative detention order against her was rescinded and she was referred to the – no less unjust – Israeli military courts, convicted on political charges and imprisoned for fourteen months, until June 2016. There is a growing international campaign demanding the release of Khalida Jarrar, Khitam Saafin and their fellow Palestinian prisoners. Political parties, organizations and movements from around the world are joining in the call for action to secure their release and protests are being organized in several cities around the world. UNADIKUM has joined this campaign and condemns the administrative detention of Khalida Jarrar in the most forceful way possible. The attack on Khalida Jarrar and Khitam Saafin is an attempt to suppress, silence and intimidate progressive Palestinian women who defend the rights of the Palestinians and their social and national liberation, especially at a time when these rights are under intense attack. Now, more than ever, it is vital to intensify the campaign in support of Khalida Jarrar and Khitam Saafin and demand their release. Two years ago, international pressure secured the cancellation of the administrative detention of Khalida Jarrar. This time, we must fight to have their administrative detention orders again canceled and to see them immediately released from the Israeli occupation prisons. UNADIKUM joins with the Samidoun Palestinian Prisoner Solidarity Network to call for the immediate release of Khalida Jarrar and Khitam Saafin, prominent progressive, feminist and feminist leaders committed to freedom and liberation for their people. The arrests of Jarrar and Saafin are a clear attempt by the Israeli occupation to attack Palestinian popular movements and to suppress them based on intimidation, imprisonment and detention carried out by the Israeli occupying forces. We urge all friends of the Palestinian cause and the Palestinian people to join the Campaign for Solidarity with Khalida Jarrar and Khitam Saafin. These detentions represent an attack against Palestinian leaders, political activity and popular organizing. We must intensify measures to condemn these arrests and demand, in all spheres within our reach, the freedom of Khalida Jarrar, Khitam Saafin and all the thousands of Palestinian prisoners behind bars in Israeli occupation prisons. On Sunday, July the 2nd, Israeli occupation forces seized Palestinian parliamentarian and prisoners’ advocate Khalida Jarrar along with Khitam Saafin, president of the Union of Palestinian Women’s Committees and at least nine other people, including Ihab Massoud, who was just released less than six months ago from Israeli prisons. The Comrade Khalida Jarrar, leader of PFLP, 13th member of the Palestinian Legislative Council, because of her commitment to Palestinian Prisoners struggle, has been repeatedly persecuted and arrested by Israeli occupation forces. Once again these seizures are carried out without charge or trial, by applying the illegal and fascist practice of administrative detention. Fronte Palestina Milan, besides denouncing these illegal and inhumane practices, which are contrary to international law, condemns these latest arrests, demands the immediate release of those arrested, calls upon the international legal community to defend the inalienable rights of the Palestinian people, opposes the Israeli state policy and fully stands with Palestinian Resistance. On July 2, during a raid, the Israeli occupating forces arrested Khalida Jarrar, Khitam Saafin and 9 other Palestinians. Khalida Jarrar, a member of the Palestinian Legislative Council, is a political leader (she is a member of the PFLP) and sits on the Board of Directors of Addameer, a Palestinian prisoners’ defense association. As for Khitam Saafin, she is president of the Union of Palestinian Women’s Committees. After a first hearing on July 5, Khalida Jarrar and Khitam Saafin were transferred to Hasharon Prison in Israel. They have just been placed under administrative detention by the occupier: Khalida Jarrar for six months and Khitam Saafin for three. This is, firstly, a violation of the Fourth Geneva Convention, which in its Articles 42 and 78 prohibits any occupying power from forcibly transferring or deporting persons from an occupied territory. Administrative detention is also a denial of the right to imprisonment without trial. As in 2016, AFPS Nord-Pas de Calais is fully engaged in the unified struggle for the immediate release of Khalida Jarrar, Khitam Saafin and all Palestinian political prisoners. It calls for massive support for the petition on this subject. During the summer, it will continue its mobilization in support of Palestinian political prisoners. AFPS Nord-Pas de Calais is making a special effort to on the administrative detention of Palestinians, and continues its struggle on this since the meeting at the Faculty of Law in Douai in November 2013. It is no longer tolerable that this is perpetuated, even as a measure “absolutely necessary” justified by “imperative reasons of security”. It is both a denial of rights and a denial of truth. An entirely unequivocal condemnation of this practice is necessary. We must give ourselves the means to do so. AFPS Nord-Pas de Calais includes this struggle in the BDS (Boycott / Divestment / Sanctions) campaign on the basis of the Palestinian appeal of 2005. It is actively participating in the campaign to suspend the EU/Israel Association Agreement for the repeated violation of Article 2 on human rights. This is solemnly addressed to elected officials. The South African Government notes with concern the arrest and subsequent imprisonment of Palestinian Legislative Council member, Ms Khalida Jarrar, who was arrested in Ramallah (Area A and under Control of the Palestinian Authority) on 2 July 2017 by the occupying Israeli military. The arrest was subsequently followed by a six month administrative detention order on 12 July 2017 without charge or trial. Ms Jarrar in addition to being a member of the Palestinian Legislative Council (PLC) is also a civil society leader and one of approximately 500 Palestinians currently in Israeli jails under administrative detention measure. South Africans are too familiar with the administrative detention measure which is similar to “detention without trial” under which political leaders could be imprisoned for days without due process at the behest of the apartheid security forces. Israel is a signatory of the Fourth Geneva Convention which embodies fair trail and the right of an accused to defend him or herself. The South African Government calls upon Israel to abide and respect the provisions of this convention as an occupying force. South Africa calls for Ms Jarrar, Vice-President of the Popular Front for the Liberation of Palestine (PFLP) and a respected leader of her people, to be accorded the space to play her rightful role in the development of the State of Palestine. 14 July, Beirut: Freedom for Georges Abdallah!